MetaCancer is an organization that is built on helping people with advanced stage cancer. MetaCancer has worked for many years building a compassionate user community and programs to support them. MetaCancer was technologically delinquent. Their old bulletin board system was the furthest thing from inviting. Partnering with the Center for Expressive Arts, MetaCancer developed a program that illustrated the healing capabilities of art as participants expressed their personal experiences through painting and poetry. MetaCancer needed a vision on how to best use technology to leverage all they had learned about their community over the years, and give them an experience that was empowering and trustworthy. Designed and built with mobile in mind, Mosaic has the simplicity of a journal with the richness of a photo or paint application. Mosaic juxtaposes technology and art for a therapeutic and empowering community experience. It represents every user’s personal journey through a challenging time in life. MetaCancer was able to bring actual patients and caregivers dealing with late stage cancer to the project. The MetaCancer organization involved their resident experts including a PhD/Psychosocial Specialist. Intuitive Company utilized its own Design Researchers as well as a contracted Art Therapist to help in the project approach, design and validation of the Mosaic experience. 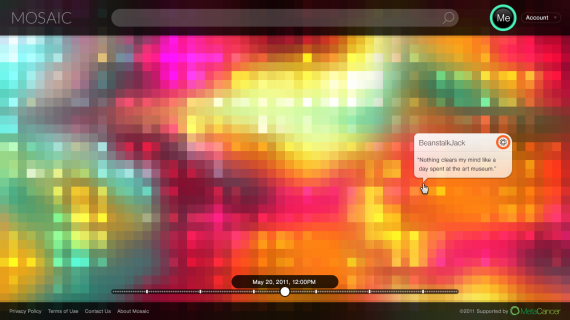 We designed Mosaic to be easy and quick to interact with. We did not want to encumber the user’s thought process or in any way interrupt them from contributing to the community. However, we learned early on that users highly valued their privacy in what they shared with the community. We designed a very simple way for users to control the reach of their posts to share with the entire community and public, with patients or caregivers, or with no one and keep their journey completely private. The comfort in how each person views and shares their personal situation was a detail we learned by directly working with the users and the experts and adjusting the application experience appropriately. 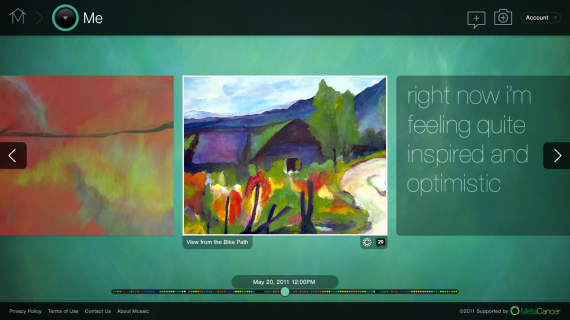 The Mosaic application is in beta release right now. The final prototypes tested very well with both patients and caregivers. They were both quick to pick it up and found using it very satisfying. Time will tell if the experience of initiating conversations (if that is the desired action) or just documenting personal feelings utilizing Mosaic as a journal, are truly adopted by the audience. MetaCancer.org has received significantly heightened interest in their programs and offerings since featuring the new Mosaic app on their home page. Intuitive Company designs and develops digital experiences utilizing a user-centered process. We design for user needs and desires balanced with a deep understanding of technology, usability and the current digital landscape. Due to the sensitivity of the subject matter at hand, we worked with a Social Psychologist and Art Therapist to ensure our approach was sensitive to the user community of MetaCancer. We then brainstormed, and later validated concepts and tested tasks with metastatic patients and their caregivers. This project would be a unique and new challenge for any design firm. We listened and adapted our approach and designs as we learned the very personal and unique needs and desires of this specific user community. We vetted words and symbols to make sure we were using a language that was positive and direct with the user community. The Mosaic experience is very visual in nature and our project process deliverables were very visual as well. We shared mood and feel boards early on to come up with a visual language that was comfortable and inviting. Later we created prototypes on the actual devices to ensure the experience was as usable as possible across all levels of technical familiarity.